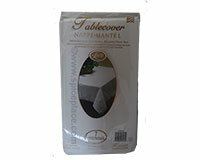 Linette Deluxe Table Covers have a deluxe absorbent tissue surface with a waterproof plastic backing. They fit most standard sized banquet tables. With Linette disposable tablecovers you have a high quality, linen-like surface that brings a touch of class to your table. These nappes are perfect for every occasion from celebrations to everyday meals. The plastic backing of a Linette tablecover provides easier handling, durability and water resistance. Linettes tablecovers also have an embossed edging that adds a simple elegance to your setting. These Linette table cloths are perfect for birthdays, camping, barbecues, picnics, parties, tailgating, graduation, anniversaries, quick dinners after work, family meals, midnight snacks, family reunions and much more.